We’ve got an exclusive update to the DJ Tech turntable that we broke at NAMM. Things have moved on dramatically in the six weeks since we last saw the DJ Tech LF-12, and it’s getting very close to being launched. This turntable is now much closer to the finished article. What we have pictures of is still very much a prototype, sent straight from the factory and the final product will be a lot more refined. Importantly, and fixing the biggest problem, the ins and outs are now recessed. We’re very happy that DJ Tech listened and fixed that one. It would have been a deal breaker for a lot of DJs, especially turntablists in need of a budget deck. The large start/stop button will sit a little lower than the one in the pictures. The change we’ve yet to see is with the tonearm. The one in the photos is a standard factory one, but it will be interchangeable with straight and S-arms in the box. The mechanism works differently to Numark’s patented TTX design: Rather than just swapping the tube itself, a fair lump of the tonearm mechanism is included in the interchangeable parts. But here’s an interesting one — the motor is capable of sending 14 bit MIDI and HID messaging using the included USB port. At this point we have no clue how that will be handled in software and while the intention is there, the actual implementation is quite unclear. There’s also some hushed tones about further advances with USB and secondary controllers too. The good news is that unlike Pioneer’s trial balloon of a turntable, the LF-12 is real with a projected but pretty definite delivery date of late April at a price of €249. That may well translate to a direct 1:1 euro to dollar price as well, but we’re awaiting confirmation. Even if it was £249, though, it would still be a great buy. 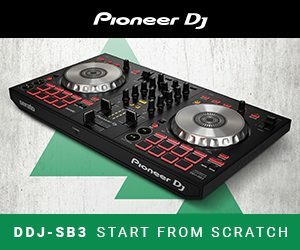 While DJ Tech doesn’t carry the same legacy of Pioneer, their gear also doesn’t come with their expected price tag. This is budget priced, but with features that others just don’t have. Time will tell if the quality will stand up, and that no corners have been cut to effect performance. One thing is for sure — you won’t read about anywhere else but DJWORX.